A rotating slide show of featured content in the center of the home page. The free shipping option is featured prominently on the home page. 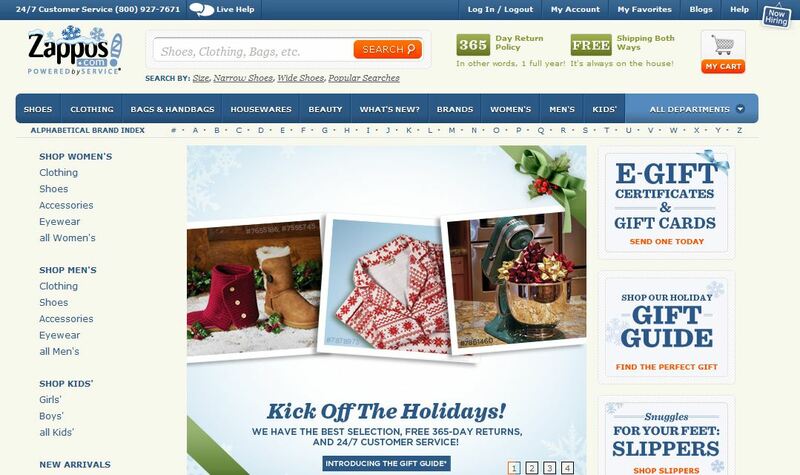 eShakti features a customer testimonial prominently in the top center of the home page; Zappos has testimonials broken out by product at the bottom of the page after scrolling. 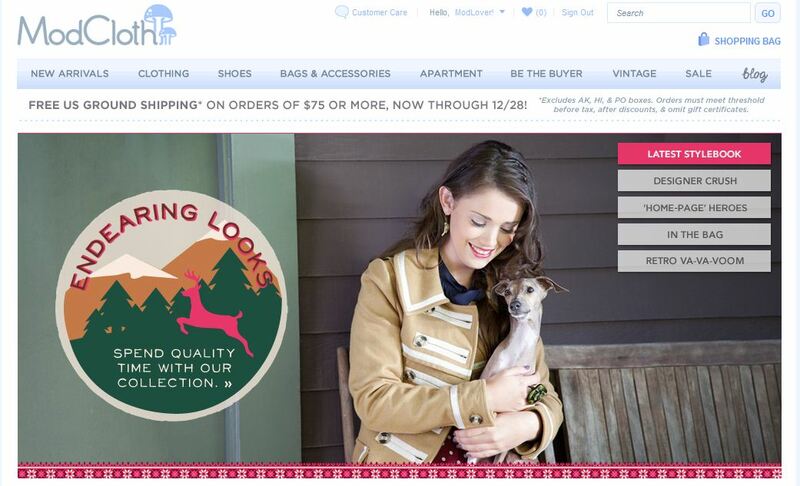 eShakti and Zappos offer a “Help” option in the top right corner; ModCloth has a “Customer Care” link with a talk bubble in the top center of the home page. Zappos also has a 24/7 Customer Service number and talk bubble in white on blue background in the very top left above the logo. 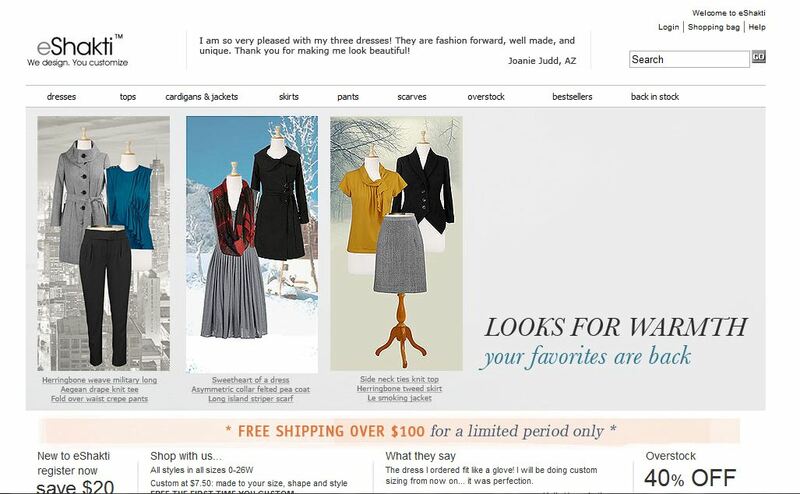 eShakti and ModCloth have social media buttons below the center images; Zappos does not display social media integration on the home page. ModCloth is clean and easy to navigate, with the bright colors of clothes and special featured designers standing out against the white background and light blue accents. The search bar and shopping cart are easy to find in the top right of the page. Social media integration is a bit buried in the lower left, though the Facebook widget is prominent in the middle right of the page. eShakti is very clean, with a stark white background and black text in a plain, easy-to-read Arial font. The color in the featured dresses draws the eye to the center navigation. The minimal scroll keeps the focus on the center of the page. The large font for featured deals: “save $20 on your first order” “40% off” is effective at drawing attention to those offers. We determined that success for all three of these e-commerce sites is if the site visitor makes a purchase. Jane needs a little black dress for a holiday party at the beginning of December (three weeks away). Jane is 32 years old and relatively tech savvy (based on our audience determination of women ages 18-45). She has shopped online before but prefers to be able to try clothes on before buying. She is concerned with finding something that fits, shipping costs, delivery time and return policy, because she plans to buy multiple options. She is a size 8. She plans to have it shipped to her office for security reasons. Her budget is $100. make it easy for customers to add items to their bag and check out (like that there is an option to checkout (button) without having to go back to the car first. only show clothing on dress forms — people like to see what things look like on actual people. make customers have to “start over” if they want to continue shopping.